The Salomon fast wing hoody is marketed as an ultra-lightweight jacket designed to be able to protect you from unpredictable weather conditions and is able to pack into its own pocket. It is aimed runners who need an extra protective layer during changeable windy conditions. Since the summer that we’ve just had could well be described as ‘unpredictable’, it didn’t take long before I was able to fully test out its credentials. This jacket has been trialled on the frequent dark, dank days we’ve been getting in the West Country and also on a particularly stormy run on the cliffs of West Wales. The secret of a good running jacket is finding the balance between offering good weather protection without compromising the breathability of the fabric, and then also making it light enough to be practical. 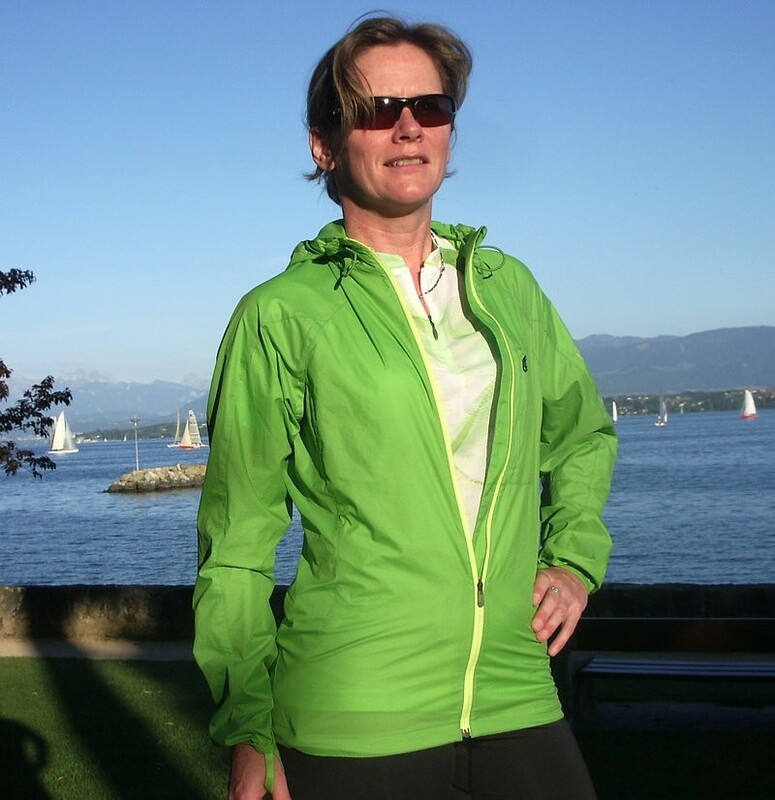 The jacket is made from Climawind fabric which is specifically designed to offer the optimal protection/breathability balance for highly aerobic activity. To be honest, I think they’ve done a good job. Firstly looking at its weather protection properties; it does offer a respectable defence against windy conditions and I certainly felt shielded from the worst of the Atlantic winds on the Welsh cliffs. It is not designed to offer protection against very cool temperatures and neither should it be – it is a running jacket after all. Whilst running, it does keep some heat in but once you stop, predictably you cool down quickly. The jackets breathability is another crucial aspect to any running layer and one that if the fabric is unsuitable can leave you feeling as if you have a cold clammy fish clinging round you. This was certainly not the case with the Fast Wing Jacket. Whilst running, there is certainly a damp sensation to the skin but that’s all – not the sopping wet experiences that I’ve had with other jackets. Finally, it really is light – 130gms to be precise, so light enough not to notice extra drag when it’s on. From a running perspective, the jacket is extremely comfortable to wear with minimal restriction to movement and it’s so light that you could well forget you’ve even got it on. I liked the feminine and fitted cut which provided both a stylish and functional finish. The reflective branding both front and back also add to the flattering shape of the jacket. There are neat thumb loops to prevent the sleeves from riding up whilst running if that is an issue for you. It also has drawcords around the bottom to make it more snug if necessary but it fitted well without using these. I have found that Salomon sizing comes up smaller than expected. I would normally take a small but found the medium fitted perfectly. The jacket is designed to be lightweight and thin however both the fabric and seams are surprisingly strong when I challenged them by stretching and tugging them. After washing, it was quick to dry and showed no distress to its shape. Likewise, after days of being kept stuffed in its own tiny pocket, I was surprised at how it immediately unwrinkled – showing no sign of the abuse it had it undergone. I confess that when I’m warmed up on a run, I tightly tie the jacket using its arms around my waist, so stressing the material significantly but so far there is absolutely no sign of wear and tear which is impressive. Salomon is careful to make no claim that this jacket is waterproof although I would describe it as being respectably ‘showerproof’. Its main function is to be windproof which it does well but I wouldn’t want to rely on it in a downpour. If cooling is needed, the front zip is easily undone to improve ventilation and this allows air to circulate through to the 2 ventilation holes under the arms. This will also minimise the dampness that can develop on the skin too. This hood has a simple shape to it with drawcords to pull it closer to the face. Without a hood peak, it offers the face little defence against any rain but keeps the head warm and protects ears from the buffeting winds. The hood drawcords are basic but Salomon have accommodated runners by neatly putting the drawcord ‘end-bobble’ on the inside of the jacket so that it doesn’t bounce and hit the runner in the face – a problem I’ve had with other running jackets. The hood can also be rolled up neatly when you don’t need it by using a popper on the inside of the hood. The jacket also features another drawcord around the backside to improve the fitting. The zip is neat, robust and easy to use. I liked the design of using a different colour to enhance the look of the jacket as well. The jacket has a single, dual-use pocket which is discretely positioned on the front panel. Although small, it can easily accommodate some keys or MP3 player. 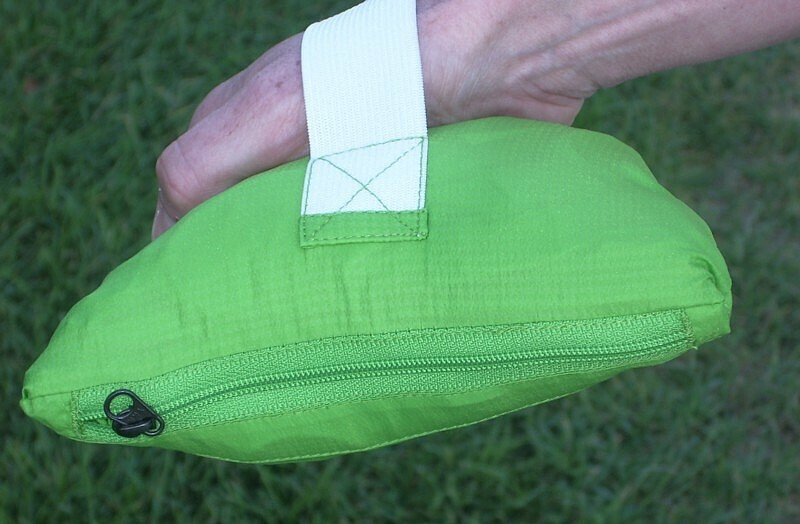 The genius of Salomon’s design is that the whole jacket can be turned inside out and stuffed into this stowe pocket, leaving it as a small light pouch with elasticated Velcro straps to aid its transportation. Salomon suggest that this is attached around the arm, however when I tried this it looked like I had developed a giant green bicep muscle as a first stage to transforming into the Incredible Hulk, so I settled on carrying it discretely in my hand. It’s easily light enough to not put you off balance whilst running. It retails at approximately £50 which I think is a good price for what it has to offer. If you’re looking for a lightweight running jacket to protect you from all the changeable weather conditions we have in this country, then this is perfect. It both looks good and performs well. Salomon has long since been renowned for its quality skiing/hiking gear and it has also proved itself to be a leading name in great run specific kit as well. More like this please!